Speedify combines available cellular and Wi-Fi connections, seamlessly providing faster, more reliable internet speeds from any iOS app. Speedify offers granular control over cellular data connections to avoid exceeding your carrier’s monthly allotment. 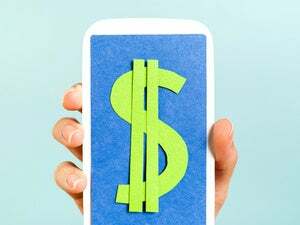 Services offering virtual private networks (VPNs) have become a booming business, and with good reason. Corporations depend on them for the additional layer of security they provide, and world travelers benefit by being able to take many of their favorite streaming video subscriptions abroad with them. But there’s another use for VPN you might not be aware of, one that can make any available Internet connection faster and more reliable in just a few taps. If you’re VPN curious and looking to squeeze the most out of your mobile connectivity, it’s as easy as downloading an app. Speedify (iTunes Store link) isn’t a VPN in the traditional sense, but rather a free, universal iOS app used to bond available Wi-Fi and cellular connections. Rather than focus strictly on security, the service splits traffic between channels, making it possible to seamlessly switch between them as needed. 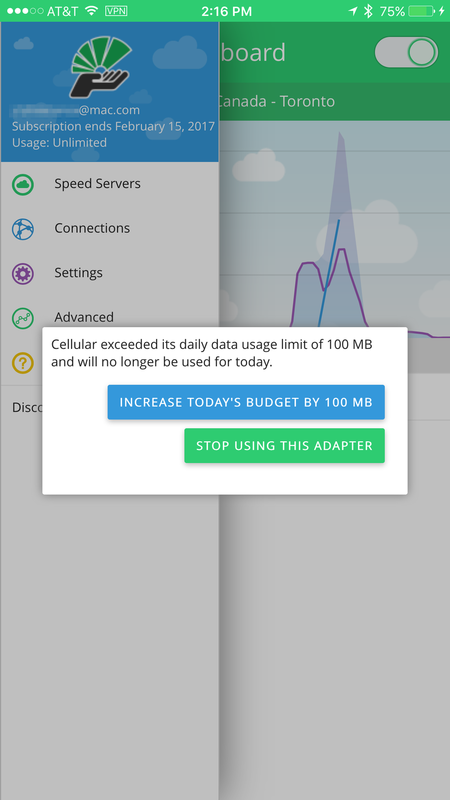 If your daily or monthly data limit is exceeded, Speedify will gently nudge you to increase it so you can keep going. The app is easy to set up: Grant permission to create a new VPN connection, then select the closest available server. While active, a VPN icon appears at the top of your home screen next to the usual cellular and Wi-Fi options. Speedify runs in the background even when the app is closed, routing data through its own secure server before sending it through the open Internet. While Speedify is open, a dashboard displays real-time graphs that measure usage, color-coded by the type of connection. In typical use, Wi-Fi is used by default, but switches to cellular on occasion for quick speed boosts, or to assure a smooth, interruption-free handoff between connections. 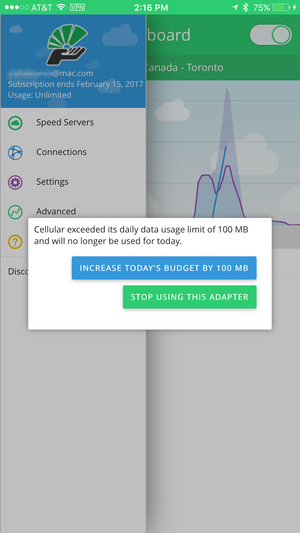 If you’re one of the millions on a cellular plan which limits the amount of data available each month, Speedify can be configured with daily and monthly caps to prevent the service from consuming too much bandwidth. Should you exceed either limit, the app sends a push notification requesting an increase, but only with your approval. 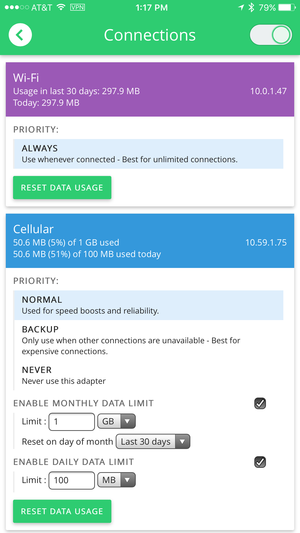 There’s an option to prevent Speedify from using cellular entirely, or treating such connections as a backup, used only when nothing else is available. The Connections screen provides feedback on how much data each adapter is using, which can be reset to start the meter running again; the Advanced screen reveals any latency and loss present in the current connection. Speedify users can select the closest available VPN server, or manually select one from the provided list of choices. In average use, the speed bump provided by Speedify is modest at best, but I immediately noticed the difference when streaming video. Services like Amazon Video started instantly, although Netflix doesn’t work at all now that the service actively blocks VPN connections. While earlier versions would drop the connection when the device was idle too long, version 3.4 introduces support for persistent connectivity. Speedify did smooth out a bump in my home wireless network, which uses a pair of linked AirPort Extreme routers for wider coverage. There’s a known dead zone in my hallway right between the two routers, but Speedify successfully filled this brief gap using cellular connectivity, allowing downloads or streaming video to continue without missing a beat. Speedify makes the most of any available internet connection, and it’s easy to configure and use, but not necessarily the most reliable on iOS devices.